One of the 900 tagged rainbow trout released in Khancoban Pondage by the DPI. 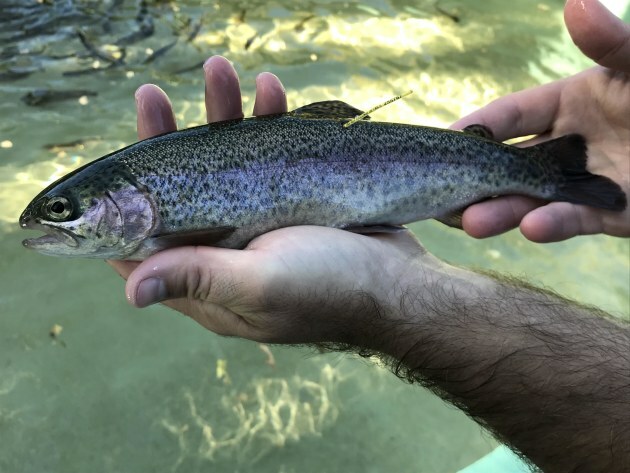 IF snagging a feisty rainbow trout isn’t exciting enough, keen recreational anglers can now add further enjoyment to their fishing experience by receiving a reward for catching a tagged fish. The Department of Primary Industries (DPI) has released 900 tagged yearling rainbow trout into Khancoban Pondage this month in the Snowy Mountains and will release a further 1000 tagged yearling rainbow trout into Oberon Dam in May. DPI Senior Fisheries Manager Cameron Westaway said anglers who get their hands on a tagged fish should report their capture to DPI and will receive a trout lure in return. “Recreational fishers who land one of these rainbow trout are asked to record their capture by phone or on the web,” Mr Westaway said. The trout, which were produced at DPI’s Gaden Trout Hatchery and the Dutton Trout Hatchery, average 25 cm in length. “Each fish has been released with a yellow external tag attached to them. Khancoban Pondage and Oberon Dam are renowned for great fishing and these fish will further boost recreational fishing opportunities in the area,” Mr Westaway said. Fisheries experts at DPI believe the larger trout will do better in the presence of redfin, which have had negative effect on both Khancoban and Oberon since they were illegally introduced. “DPI is developing longer term stocking strategies for waters with redfin. By stocking larger trout, they are too big for redfin to prey on and will provide anglers with excellent catches,” Mr Westaway said. Tagged fish recaptures can be recorded online HERE. Recreational fishers are reminded that they are required to carry a NSW current recreational fishing fee receipt at all times while fishing. Recreational fishers are encouraged to use the NSW Recreational Fishing Guide, available from DPI Fisheries Offices, most tackle shops or online HERE. Check out the FishSmart app, providing recreational fishers 24/7 smartphone access to essential information they need to know to fish in NSW. You can find it in the App Store or on Google Play.